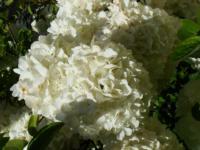 Viburnums are versatile shrubs or trees. There are many different kinds: some are evergreen, some are deciduous; some with fragrant flowers, usually white; some with red or black berries that are attractive to wildlife. They do well in most parts of southern California, but prefer regular water during the summer and protection from the hot sun inland. Many viburnums are adapted to a wide range of climate zones and soil types. They generally tolerate alkaline and acidic soils. They do best in heavy rich soils with regular summer water. They look best with some shade from afternoon sun in hot inland valleys. Prune to prevent legginess after bloom. 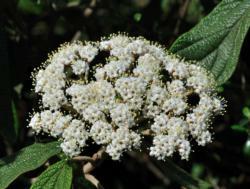 Viburnums are generally healthy, but can be affected by some pests. Aphids, spider mites, thrips and root weevils are potential pests. They may also be susceptible to fungal diseases such as leaf spot or sudden oak death caused by Phytophthera ramorum. Some cultivars are more susceptible than others, so it is a good idea to choose more resistant cultivars. In the early 1990s, a previously unknown fungus-like organism called Phytophthora ramorum was discovered infecting rhododendrons and viburnums in parts of Europe. Then this same organism was discovered in the U.S. causing the new disease "sudden oak death" in the San Francisco Bay area. In the years since, it has spread to various locations in western North America, infecting not only oaks and tanoaks, but over forty species of ornamentals, including viburnum, rhododendron, camellia, pieris, mountain laurel and honeysuckle. On viburnums, ramorum blight causes leaf blight and shoot dieback; severe infections can kill plants. Recently (December 2010), Timothy Widmer of the Foreign Disease and Weed Science Research Unit, USDA Agricultural Research Service evaluated 24 species or cultivars of viburnum to assess their susceptibility to this emerging disease threat. The results of the study showed a wide range of vulnerability. 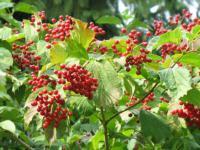 The most susceptible plants tested were Viburnum x carlcephalum 'Cayuga' and V. tinus. The most tolerant were V. x rhytidophylloides 'Willowwood' and V. opulus 'Notcutt.' In this study, above-ground parts of the plants were inoculated with the disease-causing organism, in contrast to previous studies using detached leaves. This is important because, while the individual leaves of some viburnums show extensive necrosis when they are infected, some of these same viburnums show the fewest number of infected leaves overall. In general the evergreen species and cultivars were more susceptible to infection than deciduous ones. While no one yet knows whether this disease can be contained or how far it may spread geographically, if you are in or near an area where ramorum blight has been found, it may be a good idea to choose the most resistant species or cultivars when planting viburnums in the landscape. More information on the susceptibility of viburnums to Phytophthora ramorum.